The Bucky Channel Conversation... Greg Winkler ~ The Bucky Channel - The World of Sports from Wisconsin's Perspective. Update: So many things happened today, but I wanted to keep my dad's book plug at the top of the page for a little longer. Can't blame me for that. I like to think that every soccer coaching honor my dad has ever received has been because of me. When I was five years old, I played soccer for the very first time and our team needed an assistant coach. Not knowing a thing about soccer back in 1989, Greg Winkler took one for the team and gave coaching soccer a try. Twenty years later, Pops has received numerous honors for his efforts, including two NSCAA Regional Coach of the Year honors, Wisconsin's Boys State Coach of the Year, and Youth Coach of the Year. Needless to say, the guy has come a long way. His latest achievement might actually be the one he's the most proud of, and that is that he is now a published author. In his book, Coaching a Season of Significance, Greg talks about how to make each season of yours a special one. Chapters include Setting Team Goals, Team Building, The Difference Between Boys and Girls, as well as chapters dealing with parents, players, and school administration. It's a book where he has taken all the lessons he has learned in his thirty years coaching a variety of sports, and put them within the binder of one informative, easy-to-read book. I chatted with the old man earlier today about his foray into the world of publishing. The Bucky Channel: What compelled you to write a book after almost 30 years of coaching sports? Greg Winkler: I would often have other coaches ask me questions about how I've handled different situations with both players and parents throughout my career. Somebody finally said, "Maybe you should write a book', which wasn't that bad of an idea. So I starting jotting things down during the last few years. Eventually it started taking shape, and before I knew it I had some material for a book. TBC: Much of your expertise is in the world of soccer, but you've also coached football and wrestling. Is this a book just for the soccer coach out there, or can any coach, regardless of the sport, find this book helpful? GW: If a coach gets this book and reads this, and then uses some of my practices, his/her team will benefit no matter what sport they coach. Coaching isn't just about strategies and methods to win the game, it's about relationships with kids and providing positive examples for them. That's mainly what this book is about. TBC: What I can find in this book I can't find in other books? GW: This book talks a lot about things outside of practice time. It gives you things to think about while preparing for a season or maybe if you're just starting a coaching career. My goal is to provide you with things you might not have considered otherwise. TBC: Is this a book recommended for a beginner coach? A novice? Someone who has been coaching for 15 years? GW: Any coach looking to read in hopes of improving their team and their relationships with their players can benefit. There are things in this book that can benefit you if you've coached one years or if you've coached ten years. I'd say I read anywhere from five to ten coaching books a year looking to pick up new methods. I just hope this book can be another helpful tool for a coach, just like the books I've read have been helpful for me. Honestly, it's a good book for any coach, and I'm not just saying that because of the obvious reasons. I've gotten into coaching myself over the years, and the amount of information I've learned from my dad has been invaluable. Regardless, I'm proud of my dad for successfully putting something like this together. 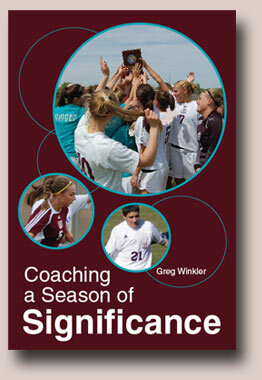 For more information on "Coaching a Season of Significance" by Greg Winkler, check out gregwinkler.net. This book is available for sale on Greg's website as well as on amazon.com.